After an Amtrak derailment in Philadelphia left eight people dead and nearly 200 injured on May 12, first responders in Maricopa refreshed their knowledge and preparation for a similar incident, according to Maricopa Fire Department Assistant Chief Bobby Miller. Despite not having much experience with large-scale train calamities, the Maricopa Fire and Police departments are well trained on how to handle a disaster, he said. In Maricopa, the train tracks run through the center of the city. 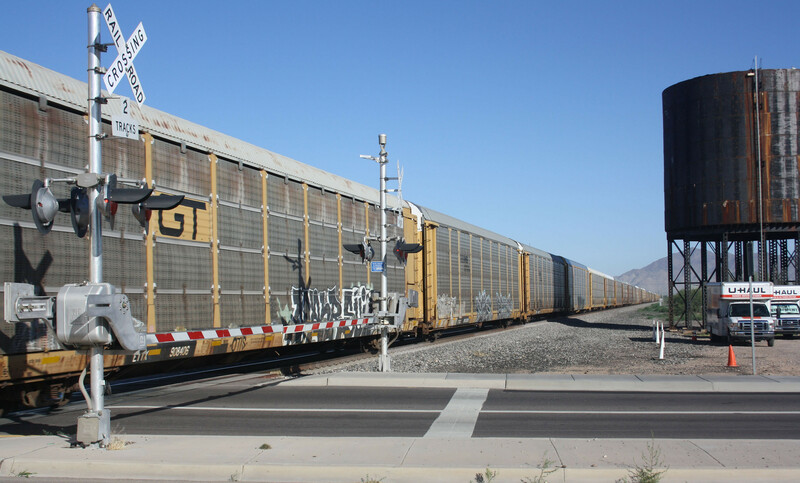 Nearly 60 trains pass through Maricopa daily. Thousands of commuters drive across the tracks each day, and many get stuck at intersections waiting for trains to pass. Of the daily trains, only one is an Amtrak passenger train (none on Wednesdays). The vast majority of the rest are freight trains carrying goods – including military equipment and hazardous material – across the country. So what would happen if any of these trains derailed in or near the city? Besides revisiting preparation procedures, Miller said he intends to expand training by working with Union Pacific Railroad directly. However, there isn’t one simple approach to a train derailment. The actions of first responders would change according to the type of train that derailed. Union Pacific trains about 2,500 first responders a year on ways to minimize the impact of a derailment in their communities, according to company spokesman Francisco Castillo. What expanded training might look like has not been determined. “Railroads, including Union Pacific, contributed $5 million in 2014 to develop a specialized crude-by-rail related training and tuition assistance program for local first responders,” Castillo said. That includes tuition at Transportation Technology Center Inc. in Pueblo, Colorado. Training covers a range of cargo situations. Another issue that arises with a freight train derailment is the impact the cargo could have on the community. If the cargo is hazardous, it could be toxic, flammable or combustible. If the cargo ignites or becomes airborne, the fire department has to ensure members of the community are out of harm’s way. Because the tracks run next to heavily-populated areas, including Maricopa High School, this is not always a simple task. This is where the collaboration between the Maricopa Fire Department and the Maricopa Police Department would play an important role. According to MPD spokesman Ricardo Alvarado, the department would set up a perimeter around the area to assist with evacuations or crowd control. Miller said it could take the fire department days or even weeks to properly dispose of hazardous material. With so many possible safety concerns, the Maricopa Fire Department views the train presence as a “target hazard” in the city. It has multiple protocols in place for everything from train derailments to trains hitting a car or having their brakes overheat. In the event of a large-scale emergency, Maricopa has additional resources at its disposal. MFD is dispatched by Phoenix Fire and part of a consortium of 20 “automatic aid agencies.” It also has mutual aid agreements with Ak-Chin, Gila River and Casa Grande fire departments.